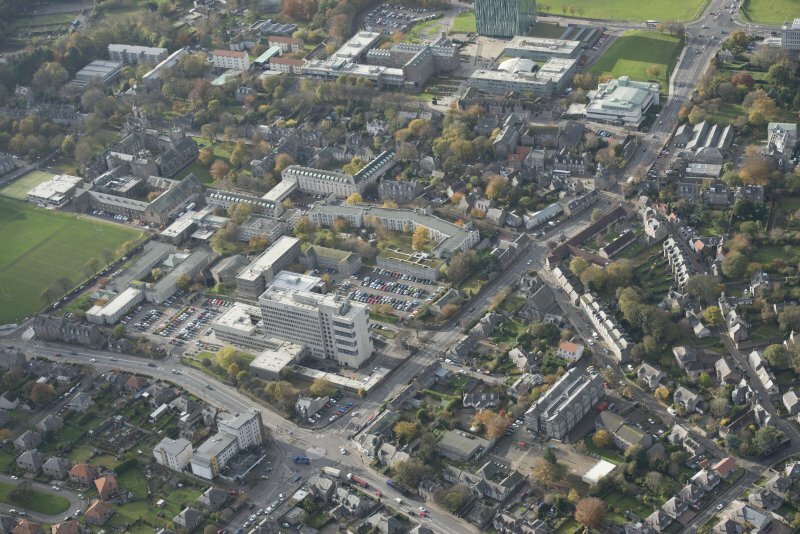 Aberdeen, Old Aberdeen, High Street, Town Street. General view from South. Aberdeen, Old Aberdeen, High Street, Town House, Interior. General view of Second Floor, main room from East. 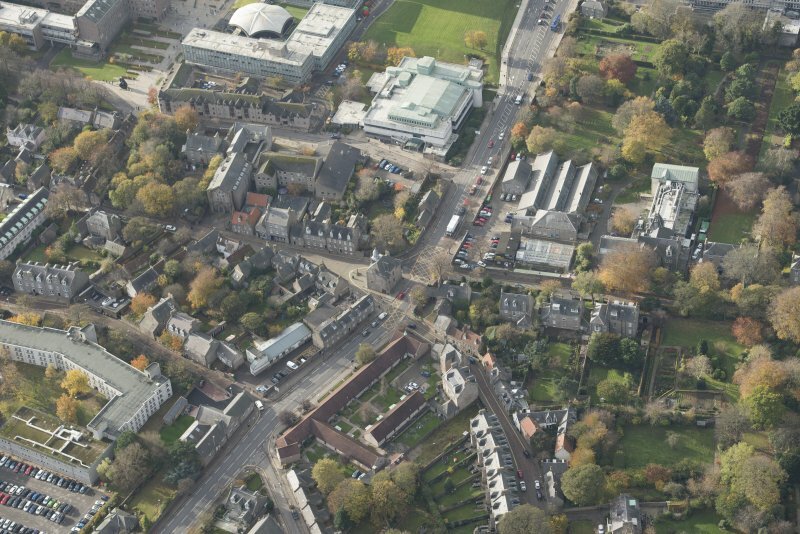 Aberdeen, Old Aberdeen, High Street, Town House. Detail of carved pediment in East wall. Aberdeen, Old Aberdeen, High Street, Town House. General view of South wall, armorial plaque above doorway. Aberdeen, High Street, Town House. General view from South showing Town House. Plans: ground, first and second floors. Preparatory drawing for 'Tolbooths and Town-houses', RCAHMS, 1996. N.d.
South elevation. Preparatory drawing for 'Tolbooths and Town-houses', RCAHMS, 1996. 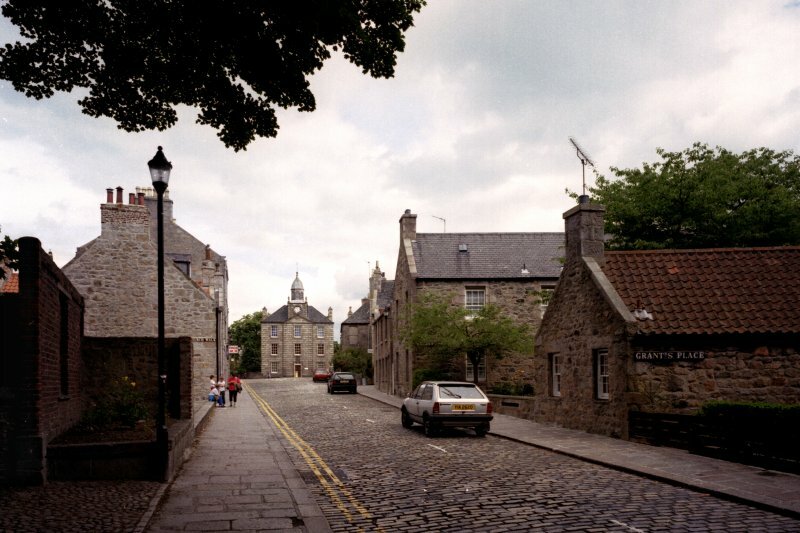 N.d.
Aberdeen, Old Aberdeen, High Street, Town House. General view from South. 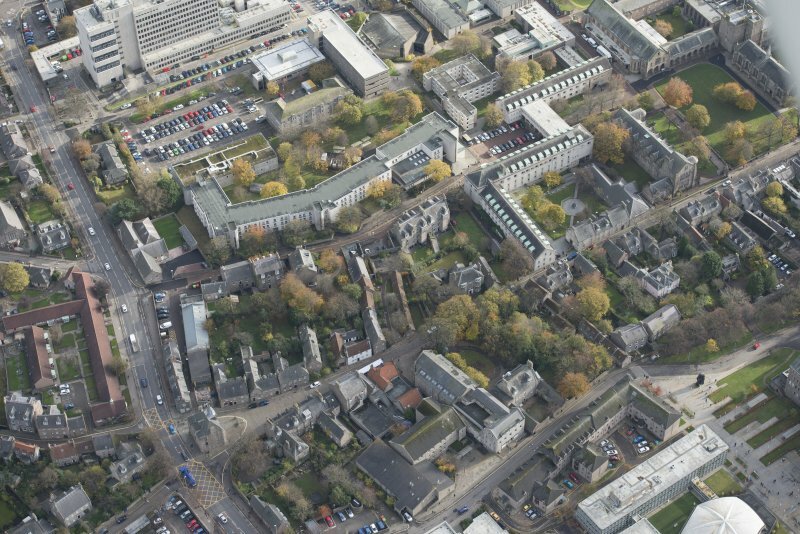 For Aberdeen, Castle Street, Municipal Buildings and Tolbooth (NJ 9440 0635), see NJ90NW 33. A Georgian building by George Jaffray, 1788, in granite ashlar; it incorporates parts of an earlier 18th century building. (Location cited as NJ 939 085). Old Town House. Georgian, built by George Jaffray, 1788; part of the Old Aberdeen A-listed group and with the interior substantially original. 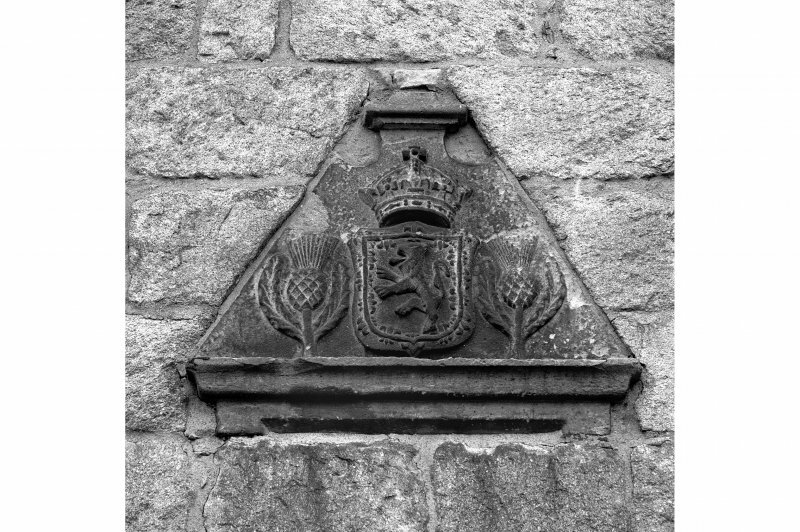 Built in ashlar granite and incorporates parts of an earlier building from which a coat of arms (1721) is in re-use. A three-storey, three-window ashlar, centre bay projects with pediment, square clock stage and cupola above. Completed by an octagonal bell house with high segmental dome and finial. In use as a library. (Newspaper and periodical references cited). Aberdeen, Old Aberdeen, High Street, Town House. 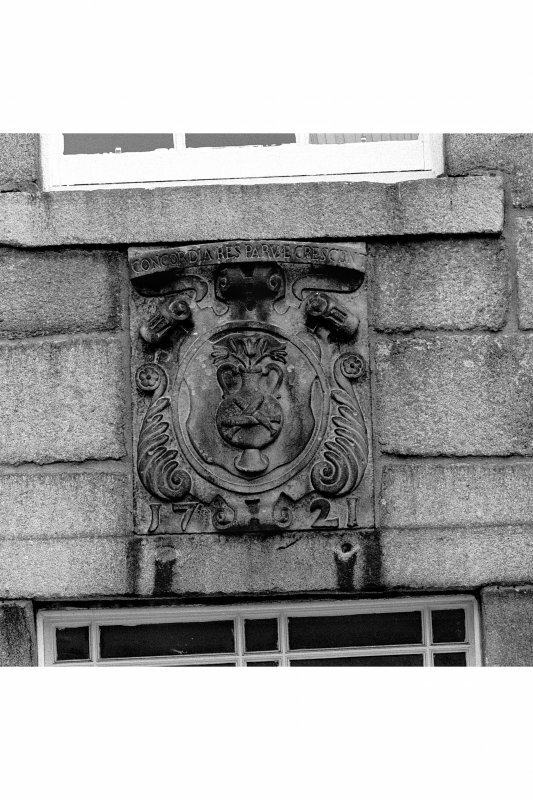 1787 Stone dated 1726 was re-used from an older structure, the present building dates from 1787. 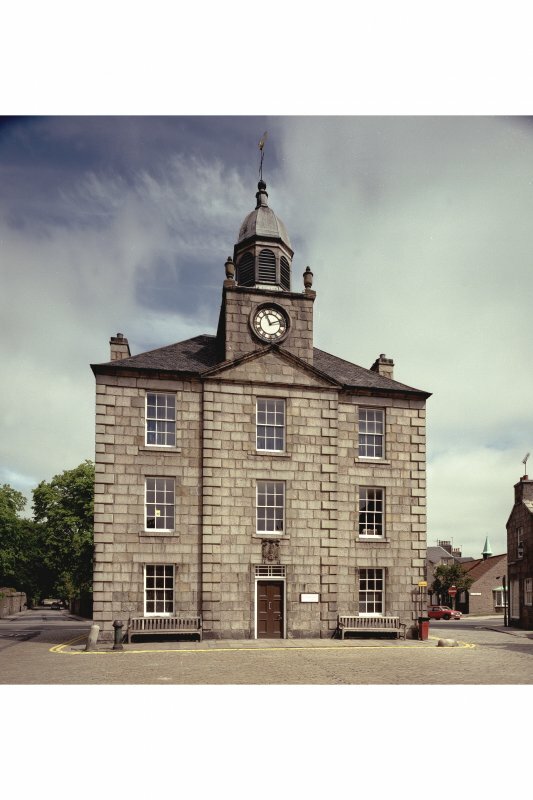 Appeal for subscriptions towards the cost of rebuilding the Town House of the City of Old Aberdeen. It is proposed to build it with accomodation for a Grammar and English School and a Hall for the different societies. Covering letter from Roderick MacLeod, Provost of Kings College. Alexander Brodie's marble of 1866 removed from Union Street and St Nicholas Street and relocated in Town House. Aberdeen Public Library, Reference Department. In Aberdeen in byegone days. In Aberdeen fifty years ago. 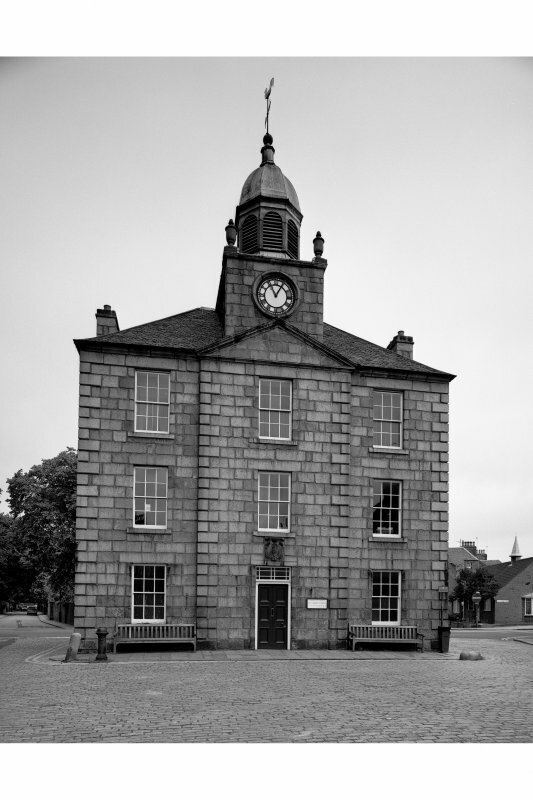 The town-house of 1788-9 forms a distinguished termination at the N end of the High Street of Old Aberdeen. Its predecessor, which occupied the same site, had been built in 1702 on the S side of an earlier council-house and song school. The present island site was formed in the 1920s by the demolition of adjacent properties to the N to allow the construction of St Machar's Drive. The town-house is three-storeyed and rectangular on plan, measuring 12.4m across the main (S) front by 9.7m. The front and side walls are built of coursed granite blocks, with raised and stepped quoins at the angles of the S front and of its projecting central bay. The rear wall is of granite and sandstone rubble which may have been re-used from the previous building. The S front has regular fenestration in three bays, the central bay being pedimented and surmounted by a small clock-tower with stone urns at the upper angles. Above this there is an octagonal domed belfry with round-headed louvred openings. The lintelled doorway in the central bay is surmounted by a stone panel carved with the burgh arms. In 1789 the town council ordained 'the old date of the Coat of Arms to be chisled out and the date of the building of the new house put upon it and painted and gilded', but the panel retains its 1721 date. Built into the Send of the E wall is another survival of the previous building, a dormer-pediment carved with the Scottish royal arms and two thistles. While some of the character of the interior has been lost in later changes of use, it preserves notable features such as the flagstone floor of the entrance-corridor and the timber balustrade of the staircase to the upper two floors. The E portion of the ground storey retains two prison-cells, extensively altered in the late 19th century. Both upper storeys have large rooms to the front, with smaller offices and stores to the rear. 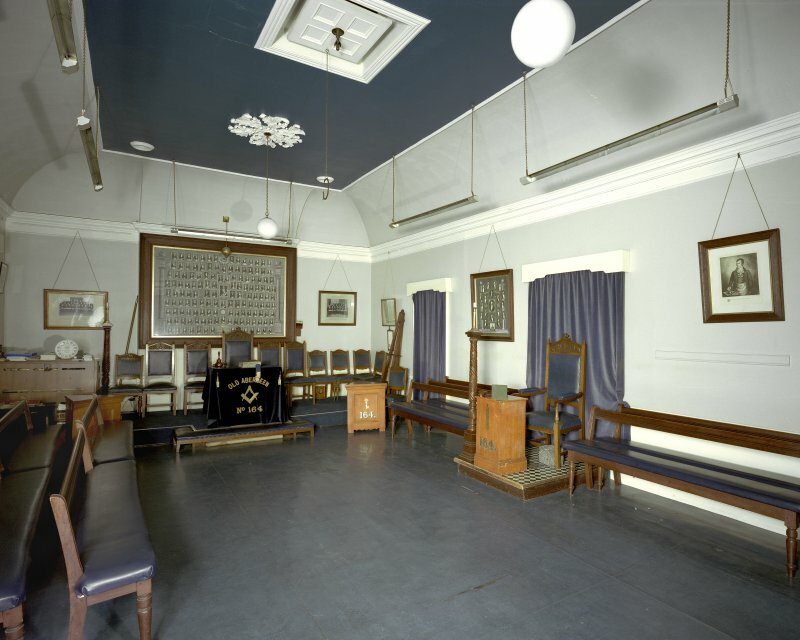 The council-chamber appears to have been on the second floor, with the main room on the first floor used for other meetings, and there were also school-rooms in both floors, The second-floor room, which now houses a Masonic Lodge, has a coombed ceiling and original cornices. 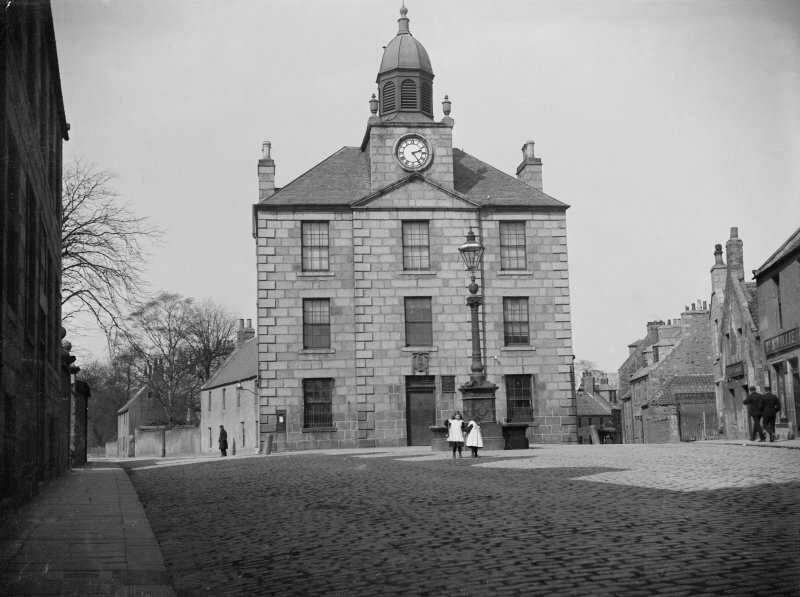 In 1713 the French bell-founder Albert Gely, who was then resident in Old Aberdeen, recast the old tolbooth bell, adding the motto: AD SACRA ET CONCILIA VOCAMUS ('Wesummon to sacred rites and to councils'). The present bell, which was cast in 1754 by Gely's successor, John Mowat, is 0.52m in diameter and bears a variant of the same motto. 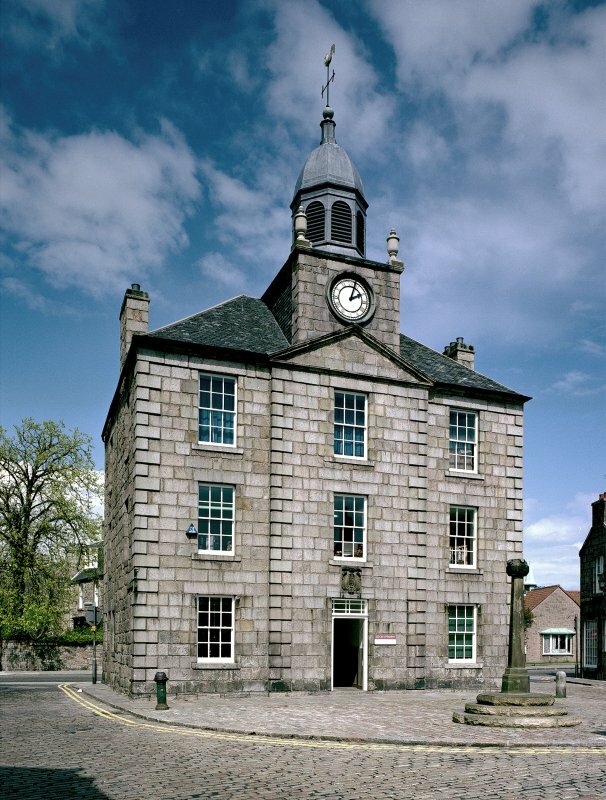 Mowat also made a clock for the tolbooth in 1719-20, and a 'globe for the moon's age' was set up at the same time. For some time previous to 1642 the town council of Old Aberdeen met in the session-house above the S porch of St Machar's Cathedral. A new building erected in that year, using material re-used from the bishop's dovecot, incorporated a song-school and weigh-house as well as a first-floor room 'called the Council-House'. 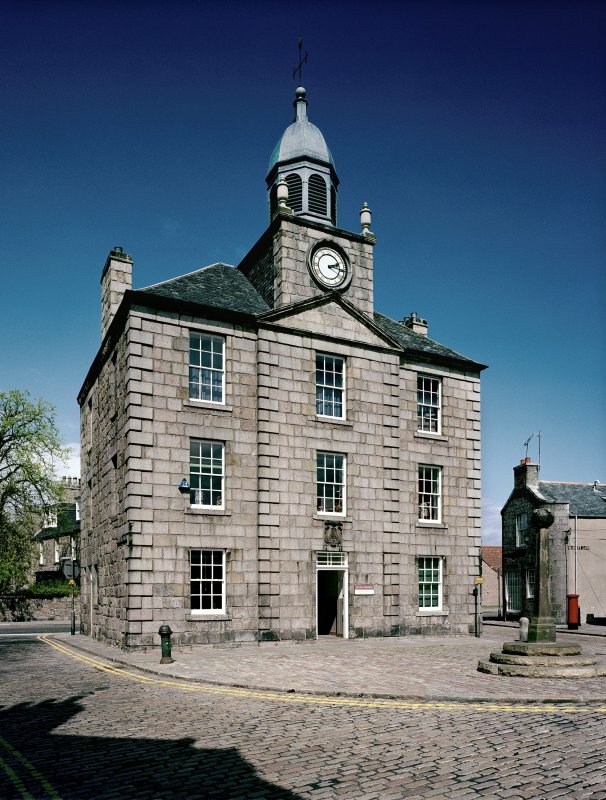 A new tolbooth, 'ane prison house with ane bell and a clock', was built to the S in 1702. In 1769 it was decided to install the cistern for a new water supply in the ground-floor room of the prison, but the 'decayed state' of the building soon led to its complete replacement. 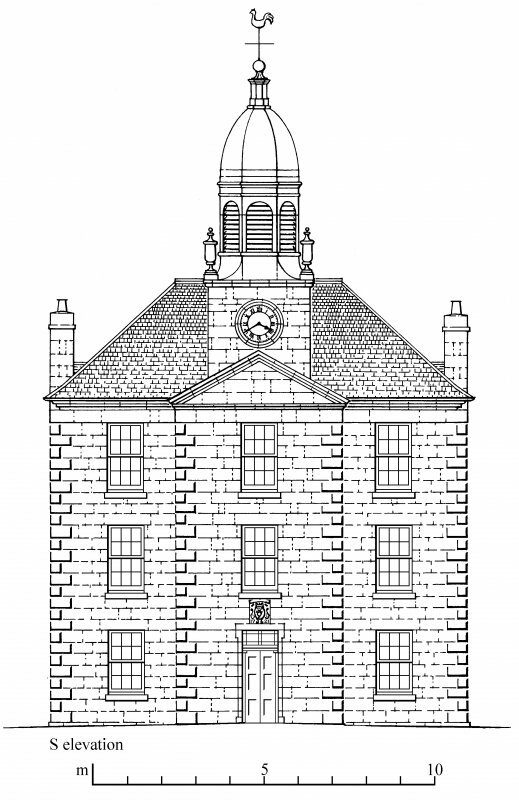 In 1787 the council instructed a local builder, Convener George Jaffray, to prepare plans for rebuilding their townhouse, and after receiving tenders for executing two plans of differing scale they accepted that submitted by Jaffray himself. His estimates were 'as reasonable as any given in and much below several of them'. The cost of a new building was a particular concern of the council, whose members were partly responsible for funding it, and they had already determined that materials from its predecessor should be re-used. Work began in 1788, and was completed in the following year. 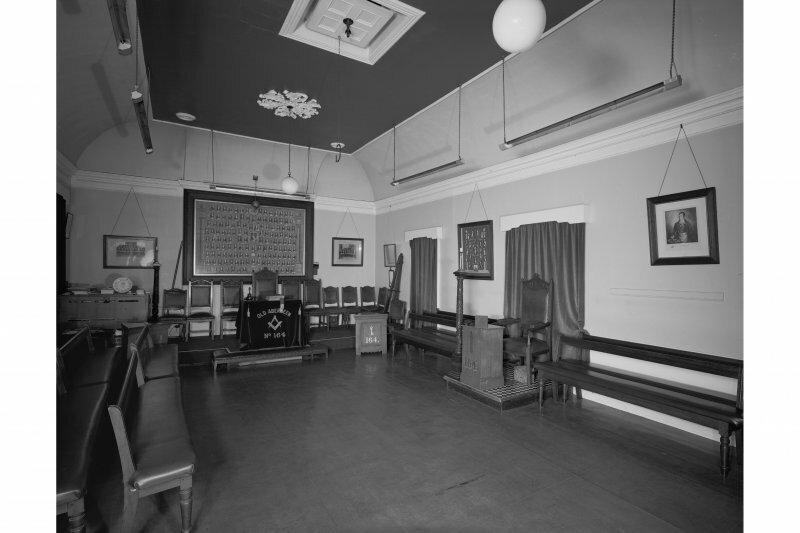 The local merchants' society, incorporated trades and masonic lodge had all contributed to the cost of the new building and they were permitted to use it for meetings, subject to the requirement to share a single key. Revenue was also raised by renting out the meeting-rooms for a variety of purposes including dancing-lessons and dramatic performances.